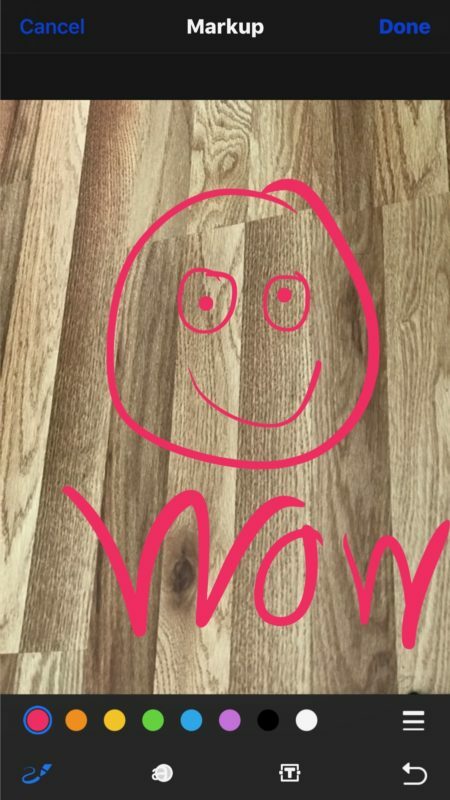 The excellent Markup ability in iOS allows iPhone and iPad users to write, draw, and markup on any photo or picture stored on their device. This offers a nice way to highlight or emphasize something on an image, and while it can be used for fun it’s equally as useful for professional users as well to annotate images. 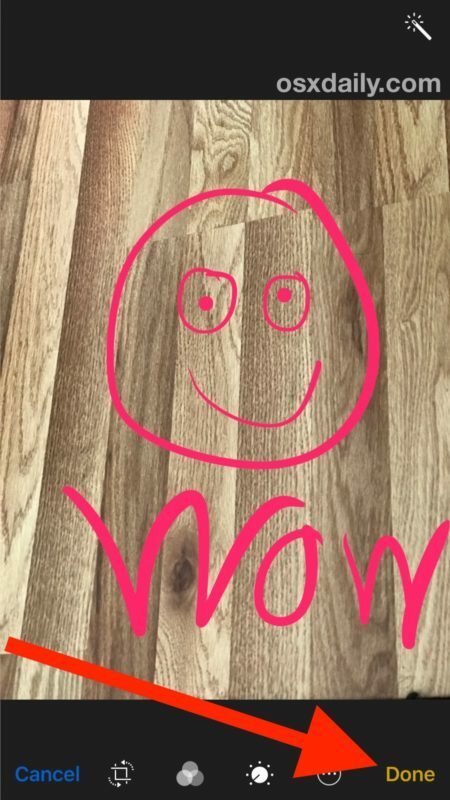 Markup is a fantastic feature but it’s tucked away behind a nondescript button option in the photos editing features of iOS, so many users can overlook the markup ability without ever knowing it exists. If you don’t find the ability using the instructions below, you likely need to update iOS to a newer version. 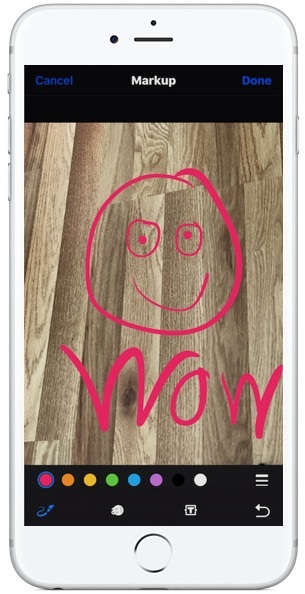 Once you have marked up a photo you can use your scribble, modifications, drawings, or whatever other masterpiece you have created like any other picture on an iOS device. This means you can send the marked up photo, post it to social media like Facebook, Twitter, or Instagram, email it to someone, embed in a notes app, or whatever else you want to do with it. If you don’t see the markup ability, be sure you have updated to the latest version of iOS available. The feature was introduced natively into the Photos app in iOS after the 10.0 release and thus will not exist in prior versions. Mac users will find a similar Markup feature in Mail for Mac, and of course can use Preview app to add text or annotations to images. The Markup and photo editing features on iOS are numerous, the same editing panel section allows you to adjust light and color of photos, rotate, straighten, crop, remove red eye, digitally sign documents in iOS from Mail app, and much more. Know of any great uses or tricks for the Photos Markup feature in iOS? Let us know in the comments! My Photos in iPad do not have all the symbols above the photos that you show, and when I tried to update software, it told me that my software is up to date. Is this trick related to your location or ISP? For me it is not available. Try opening one of your photos in the photos app. On ipad, the white bar with icons shown in the first picture above will be at the top of your screen (not the bottom as shown there, because the screenshot shown is from an iphone); if you don’t see it, just tap on the photo again and it will appear. Towards the right, look for the editing icon next to the delete (trash can) icon. Once you tap on it you should see the other screens shown above. Note that the editing features are only available in iOS 9 or later, which some older ipads don’t support. To see what version you have, go to settings>general>about. It’s also worth noting that in addition to mail for mac, markup is also available in the iOS mail app, not mentioned in the article. Does that work on an iOS iPad mini 4? because instead of a circle with 3dots in it it has a little wand. This is a great feature that is hidden. I used it recently and had to google how to find it. Thanks for this article that I can share. What I find perplexing is that any markups you do to a picture do not export (easily) out of the iOS/mac photo ecosphere. Like, if you use lightroom (or other non-apple photo apps) to store/edit pictures, when you import marked up pictures from your phone into lightroom, the markups aren’t here. There are various workarounds for this, but it’s still a pita. they do if you use markup in the mail app instead of photos. What I *really* want is a way of making notes, photo description, which is shared between iOS and OSX, without marking the photo. I always use Phonto app to do that. It will be saved as a new photo in Camera Roll…. free and user friendly app. How do I access the iOS keyboard when using the Text tool? Thanks. I have the same question as Beth. All worked well until that point. I’d rather type on the photo instead of writing with my finger. I have exactly the same problem as Beth and Bernie! David – Bernie – Beth => to open/seen the keyboard you have to double click on the text field. What I would love is the option of doing magnifications without the circular border. Like having round spots zoomed in and selecting for them to be sans physical border, ya know? I tried to add an arrow in markup on iPhone with iOS 10. 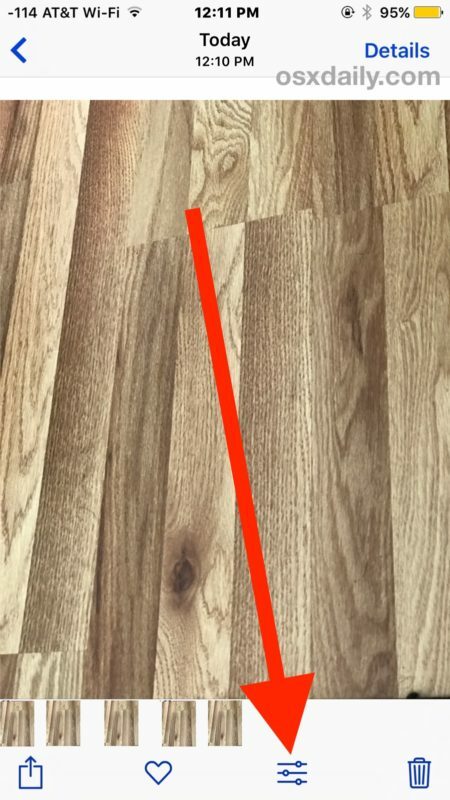 The mark up tool allows me to draw a line, but I see nowhere the ability to make that line and arrow. How can I write on my photos on my ipad mini please? I can do it on my iphone but can’t see all the symbols on my ipad mini. Thanks. Writing with fingers is cumbersome. Are there styluses that can be used with iPhone 6? After editing a photo, employing the magnifier, I cannot figure out how to remove the mangnification circles. Any advice would be greatly appreciateld. Thanks. 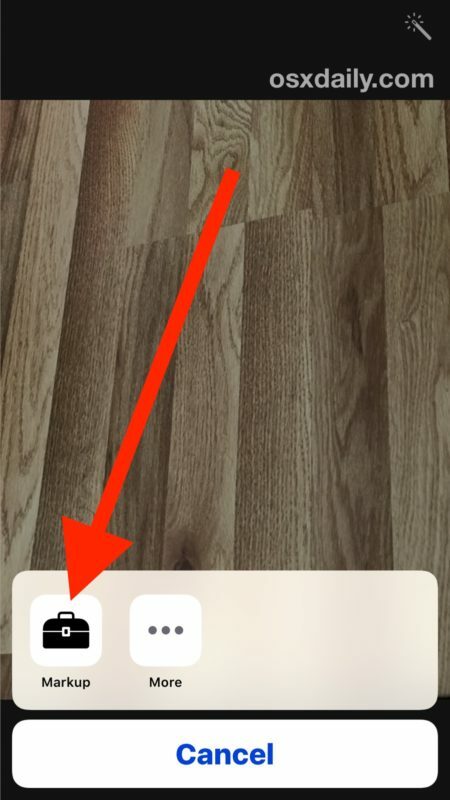 If I markup a photo will it also be marked in other folders within the app that have the same photo? Is there any way to either make a shortcut so that I don’t have to make so many clicks to get to marking up the photo OR turn from one photo to another without having to click in and out of editing?? Thanks in advance for any help with these questions. I mark up fine but the markups are gone when transferring the photos to the laptop. why? Text annotations can be added easily on my wife’s iPad (iOS 10.3). Sometimes you can rotate such text using two fingers, but whether this achieves anything or not seems to be completely random. Does anyone know the secret of control? Another issue: tapping the screen sometimes leads to a coloured dot or line being added when that is not the intention. Again, does anyone know the trick for stopping this happening at all? On a iPAD with IOS 11.3 I can find the text function and the magnifying glass. But typing does not produce letters, not after any step in the procedure. The iPad guide manual says nothing about how to enter texts in photo’s. Hi, I have an iPad Pro and I know how to add Text to my photos, but how do you change the SIZE of the text? I can’t find a way of changing it at all. To add text with changed font size… choose a photo. Click edit. Click the circle with three little dots inside. Click Mark Up. Click More. Click text. The word Text inside a box with blue dots on each side will appear on your picture. You can drag the box where you want it. At the bottom of the screen, you’ll see a small capital A and a large capital A. Click this and use slider to adjust the size of your font. After your done typing message, you can expand or contract the message using the blue dotted box and two fingers. Click done. Now you can send it any way you want! This Tip I didn’t know before, only in Notes-but now I can driving directly on photos, it looks pretty and amazing-thanks for great tips!